If you had been around in 1891 watching a ‘basketball’ game. You might not have been able to see any future for the game. It would have been early December in Springfield, Massachusetts, on a rainy day. Dr. James Naismith, a Canadian physical education professor, and instructor at what is now, Springfield College, was looking for a way to keep his students conditioned during the long winter months in New England. He came up with a game that could be played in the gym and would not have the number of injuries that his students got when playing football. Dr. Naismith wrote the basic rules. The objective of the game was to throw a soccer-type ball into a peach, fruit basket that was nailed to the lower railing of the gym balcony, 10-feet up. Every time a basket was made, the game had to be halted so a custodian could bring out a ladder to retrieve the ball from the basket! You can imagine how awkward and slow that made the game. Later the bottom of the peach basket was removed, but still, the ball had to be poked out of the basket with a long dowel every time a basket was made. The ball that was used was a soccer-type ball. There was an inner lining or bladder and the outer ball was made of sewn together, leather segments with laces, to cover the opening for inflating the ball. The laces made it difficult to pass or dribble reliably. Bounce passes were the main way for the ball to change hands from player to player, dribbling came later in the game’s development. Newer methods for making basketballs were invented that didn’t use laces. The first basketballs were brown in color. Searching for a ball that would be more visible to players and spectators, the orange colored ball was introduced in the late 1950s and is now in common use. As the quality of the basketball improved, the use of dribbling became a bigger part of the game and the means of transporting the ball down the court. Because the fruit baskets were nailed to balconies in the gym above the court, spectators would sometimes interfere with the basketball shots. Backboards were introduced to end the spectator interference. In 1906, the peach baskets were replaced with metal hoops attached to the backboards. Nets were added to the rims to allow the ball to pass through the hoop, to be seen and more controlled. With the backboard addition, rebounding became an important offensive and defensive part of the game. The first official basketball game was played at the YMCA gym in Albany, New York, on January 20, 1892. There were nine players. The game ended with a score of 1–0; the game winning shot was made from 25 feet away, on a court just half the size of the present-day official NBA court. Remember that basketball was invented to help keep athletes in shape for the winter. Most of these athletes were football players. At the time, football was played with a team of 10, which only later was changed to 11. When winter weather got too wet, cold and icy to play football, teams were taken indoors. It was convenient to have the football team split in half, and play basketball with five on each side. By 1897–1898 teams of five became the standard number of players. People were enthusiastic about this new game and its popularity quickly spread throughout the United States and Canada. In 1901, colleges and universities, including the University 0f Chicago, Columbia, Cornell, Dartmouth, University of Minnesota, the U.S. Naval Academy, the University of Colorado and Yale, began sponsoring men’s basketball games. In 1905, frequent injuries on the football field prompted President Theodore Roosevelt to suggest that colleges form a governing body. A governing body for the nation’s college sports could protect players and govern the games to help make them less dangerous. The desire to form a governing body for sports at the college level resulted in the creation of the Intercollegiate Athletic Association of the United States (IAAUS). In 1910, the name was changed to the National Collegiate Athletic Association, the current NCAA. 1948 to 1951. It was after this that the NCAA won more support than the other governing organizations. Today, basketball is one of the world’s most popular sports. What started as a college sport became a professional one in 1946, with the organization of the NBA, National Basketball Association. The NBA has become a multi-billion-dollar business. Professional basketball players are some of the highest-paid athletes in the world. In fact, basketball is played around the world with national teams participating in a Basketball World Cup. Today most people learn the game of basketball having played on outdoor asphalt courts. Standard asphalt is still the most common outdoor basketball court material. Asphalt has the strength and the ability to stand up to weather extremes. But over time asphalt will break down developing cracks or chips and other imperfections in the surface. Asphalt is also very unforgiving as a surface and players can be injured by such a rough court surface. Basketball court surfaces have a big impact on the quality and enjoyment of the game. The surface should provide good traction, good bounce, and durability. Outdoor courts need to stand up to extreme heat and cold weather conditions including moisture. A concrete basketball court provides a smooth, durable and consistent surface and should be installed with a vapor barrier and sealant. After years of use a concrete court can be re-surfaced which will extend the useful life of the court. Taylor Tennis Courts have the expertise that you need in building your basketball court. They can take on your basketball court construction project from the ground up. 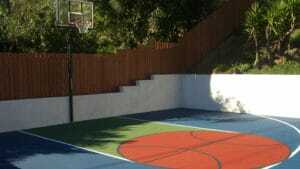 Many homeowners put in a ½ court basketball court which can be also be used to play other sports. The surface of the court must be just right to give hours of enjoyment in playing the game of basketball. When you think about it, many skills are used in playing this game invented to keep athletes in shape: shooting, passing, dribbling, dunking, shot-blocking, and rebounding. What are you waiting for? Join the millions of other basketball players around the world, let Taylor Tennis Courts build your basketball court today.